Inspired by the tremendous impact Shishu Sadhana has had, Kala Bharati and in particular, its Artistic Director, Mamata Niyogi Nakra have made several forays into the field of “dance and the child” with specific objectives in mind. Dhitang is the rubric under which the activities will take place, in which the focus will be on dance as a tool for the holistic development of a child. Chennai based well-known musician, O.S.Arun, who has composed the music for the child-friendly repertoire, speaking of his involvement with Shishu Sadhana has remarked “ I do not think of Shishu Sadhana as a project or undertaking, I think of it as a movement”. A reflection of his thoughts was the Dance Mela in Kolkata on the 7th of January 2007. Dhitang Kolkata, a collective of dance teachers from the city formed on World Dance Day 2006, had organized the Dance Mela in collaboration with the Sri Aurobindo Institute of Culture, which incorporated the event into their larger programme ‘Aspirations 2007’. About a hundred children in the age group four to fourteen, from various dance schools of the city participated in the festival. Excitement in the air was palpable as children, all learning dance, escorted by their dance teachers and parents, gathered for the Mela in the sprawling premises of Sri Aurobindo Institute. They were warmly greeted and received with the usual Indian offering of mishree and bindi by volunteers from the ranks of the senior students of the participating schools. They were divided into three groups called Kinkini (4-7), Mukula (7-10) and Alapadma (10-14). Each of the groups participated in three different workshops with visual- arts-based, music-based and text-based activities. In the last one some clips from the DVD Shishu Sadhana were shown. Mamata Niyogi-Nakra, of Kala Bharati, Montreal, along with her husband Harbans Nakra, was in Kolkata and participated in the Mela. Also present in the Mela was O.S. Arun, whose participation was greatly appreciated by the children and the parents. When the Kinkini group performed some animal movements, which they had learnt in one of the workshops, he supported them with a spontaneous musical accompaniment. It was an experience for the little ones that they will recall in later life as one of a lifetime. The event concluded with performances by the participants representing their different dance schools. 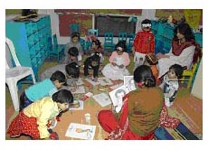 Members of Dhitang who planned and conducted the activities came from varied backgrounds. Among them were Bharata Natya teachers Arnab Bandopadhaya, Debika Guha-Mitra, Shreeparna Ghoshal and Sucharita Sharma, joined by Suman Sarawgi, dance teacher for physically challenged children and Sohini Chakraborty, dance therapist. Teachers, participants and their parents were full of praise for the Mela and are looking forward to other such dance related activities.